If I had finished this book a little sooner, it would have been a perfect Halloween read for middle-grade readers. 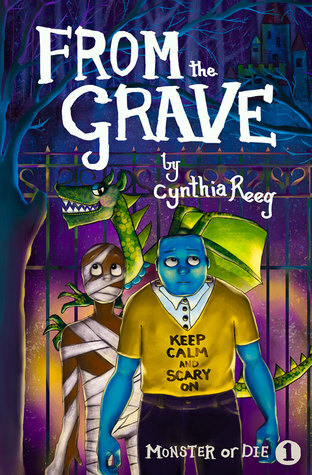 The first book in a series, From the Grave follows the misfit Frankenstein Gordon and his friends. They're misfits because they're not as frightening as adult monsters feel they should be: Frank has blue skin instead of green and loves being clean, his friend Oliver is a mummy that won't stay wrapped, Georgina is a dragon that breathes water instead of fire. They're in the remedial class at school, but if they don't improve fast enough, they will be exiled to a distant island because they're not monster enough. Frank is often bullied by Malcolm, the principal's pet, but there are secrets that Frank uncovers in his quest to prove that he and his fellow misfits are truly monster enough. There are lots of fun touches that readers would appreciate, as ordinary terms are given a monster twist. It also brings up how children can deal with being bullied by older children or if they aren't heard by adults in their lives. Frank is also grieving the loss of his grandmother, who he had been very close to. There are conflicts between him and his friends as they try to come up with plans to prove their abilities, which is a very human characteristic that children can relate to. Chapters alternate between Frank and Malcolm, giving alternate viewpoints as the story progresses. We also see into the bully's psyche and are able to see that the bluster can cover up insecurity and doubt. This is a great start to a series that will undoubtedly help children deal with issues, and give them a convenient way to discuss them with the adults in their lives.